A semi-arid wasteland near Tirunelveli, Tamil Nadu. Monsoon clouds dump torrents of rain on lush forests only kilometres away in windward-facing Kerala, but the Agasthyamalai Range of the Western Ghats (background) prevent them from reaching Tirunelveli. The climate of India comprises a wide range of weather conditions across a large geographic scale and varied topography, making generalisations difficult. Analysed according to the Köppen system, India hosts six major climatic subtypes, ranging from desert in the west, to alpine tundra and glaciers in the north, to humid tropical regions supporting rainforests in the southwest and the island territories. Many regions have starkly different microclimates. The nation has four seasons: winter (January and February), summer (March to May), a monsoon (rainy) season (June to September), and a post-monsoon period (October to December). India's unique geography and geology strongly influence its climate, particularly in the Himalayas in the north and the Thar Desert in the northwest. The Himalayas act as a barrier to the frigid katabatic winds flowing down from Central Asia. Thus, North India stays warm or only mildly cold during winter; in summer, the same phenomenon makes India relatively hot. Although the Tropic of Cancer—the boundary between the tropics and subtropics—passes through the middle of India, scientists consider the whole country tropical. As in much of the tropics, India experiences unstable monsoonal and other weather conditions: major droughts, floods, cyclones and other natural disasters occur sporadically, killing or displacing millions. Global warming further threatens India's long-term climatic stability. Climatic diversity in India makes the analysis of those issues complex. A scene in Uttarakhand's Valley of Flowers National Park. In contrast to Tirunelveli, the park receives ample orographic precipitation due to its location in a mountainous windward-facing region wedged between the Zanskars and the Greater Himalayas. The formation of the Himalayas (pictured) during the Early Eocene some 53 million years ago proved a key factor in determining India's modern-day climate; global climate and ocean chemistry may have been impacted. During the Late Permian (some 260–251 million years ago (mya)), the Indian subcontinent belonged to the vast supercontinent Pangaea. Despite its position within a high-latitude belt at 55–75° S (as opposed to its current position between 5 and 35° N), latitudes now occupied by such places as Greenland and parts of the Antarctic Peninsula, India likely experienced a humid temperate climate with warm, frost-free weather, though with well-defined seasons. 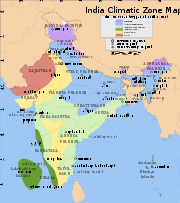 Later, India joined the southern supercontinent Gondwana, a process beginning some 550–500 mya. During the Late Paleozoic, Gondwana extended from a point at or near the South Pole to near the equator, where the Indian craton (stable continental crust) positioned, resulting in a mild climate favorable to hosting high-biomass ecosystems. India's vast coal reserves (much of it from the late Paleozoic sedimentary sequence) the fourth-largest reserves in the world underscores that. During the Mesozoic, the world, including India, experienced considerably warmer weather than today. With the coming of the Carboniferous, global cooling stoked extensive glaciation, which spread northwards from South Africa towards India; that cool period lasted well into the Permian. Tectonic movement by the Indian Plate caused it to pass over a geologic hotspot—the Réunion hotspot—now occupied by the volcanic island of Réunion. That resulted in a massive flood basalt event that laid down the Deccan Traps some 60–68 mya, at the end of the Cretaceous period. That may have contributed to the global Cretaceous-Tertiary (K-T) extinction event, which caused India to experience significantly reduced insolation. Elevated atmospheric levels of sulphur gases formed aerosols such as sulfur dioxide and sulfuric acid, similar to those found in the atmosphere of Venus; these precipitated as acid rain. Elevated carbon dioxide emissions also contributed to the greenhouse effect, causing global warming that lasted long after the atmospheric shroud of dust and aerosols had cleared. Further climatic changes 20 million years ago, long after India had crashed into the Laurasian landmass, proved severe enough to cause the extinction of many endemic Indian forms. Meanwhile, the formation of the Himalayas resulted in blockage of frigid Central Asian air, preventing it from reaching India; that made its climate significantly warmer and more tropical in character. India serves as home to an extraordinary variety of climatic regions, ranging from tropical in the south to temperate and alpine in the Himalayan north, where elevated regions receive sustained winter snowfall. The Himalayas and the Thar Desert strongly influence the nation's climate. The Himalayas, along with the Hindu Kush mountains in Pakistan, prevent cold Central Asian katabatic winds from blowing in, keeping the bulk of the Indian subcontinent warmer than most locations at similar latitudes. Simultaneously, the Thar Desert plays a role in attracting moisture-laden southwest summer monsoon winds that, between June and October, provide the majority of India's rainfall. Experts have designated seven climatic zones falling into four major climatic groupings, defined according to traits such as temperature and precipitation. Meteorologists assigned codes groupings (see chart) according to the Köppen climate classification system. A tropical rainy climate covers regions experiencing persistent warm or high temperatures, which normally stay above 18 °C (64 °F). India hosts two climatic subtypes that fall under that group. The most humid, the tropical wet monsoon climate, covers a strip of southwestern lowlands abutting the Malabar Coast, the Western Ghats, and southern Assam. That climate prevails in India's two island territories, Lakshadweep and the Andaman and Nicobar Islands. Characterized by moderate to high year-round temperatures, even in the foothills, rain falls seasonally but heavy—typically above 2,000 millimeters (79 in) per year. Most rainfall occurs between May and November, adequate for the maintenance of lush forests and other vegetation throughout the remainder of the year. December to March represent the driest months, when days with precipitation are rare. The heavy monsoon rains create the extremely biodiverse tropical wet forests of those regions. India commonly experiences a tropical wet and dry climate. Significantly drier than tropical wet zones, it prevails over most of inland peninsular India except for a semi-arid rain shadow east of the Western Ghats. Long Winter and early summers typically bring dry periods with temperatures averaging above 18 °C (64 °F). 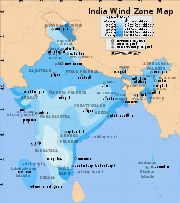 Indians experience exceptionally hot Summers; temperatures in low-lying areas may exceed 50 °C (122 °F) during May, leading to heat waves that occasionally kill hundreds of Indians. The rainy season lasts from June to September; annual rainfall averages between 750–1500 millimetres (30–59 in) across the region. Once the dry northeast monsoon begins in September, most precipitation in India falls on Tamil Nadu, leaving other states comparatively dry. A tropical arid and semi-arid climate dominates regions where the rate of moisture loss through evapotranspiration exceeds that from precipitation; it is subdivided into three climatic subtypes. The first, a tropical semi-arid steppe climate, predominates over a long stretch of land south of Tropic of Cancer and east of the Western Ghats and the Cardamom Hills. That region, which includes Karnataka, inland Tamil Nadu, western Andhra Pradesh, and central Maharashtra, gets between 400–750 millimetres (16–30 in) annually. Drought-prone, the region tends to have less reliable rainfall due to sporadic lateness or failure of the southwest monsoon. North of the Krishna River, the summer monsoon brings most the rainfall; to the south, significant post-monsoon rainfall also occurs in October and November. In December, the coldest month, temperatures still average around 20–24°C (68–75 °F). March to May experience hot and dry weather; mean monthly temperatures hover around 32°C, with 320 millimeters (13 in) precipitation. Without artificial irrigation, that region proves unsuitable for agriculture. The Rann of Kutch, a vast salt marsh south of the Thar Desert in Gujarat. During the monsoon season, the region fills with standing waters. Most of western Rajasthan experiences an arid climatic regime. Cloudbursts bring virtually all of the region's annual precipitation, which totals less than 300 millimeters (12 in). Such bursts happen when monsoon winds sweep into the region during July, August, and September. Such rainfall proves highly erratic; regions experiencing rainfall one year may wait a couple of years or so before the next rain fall. Continuous downdrafts, for the most part, prevent precipitation. The summer months of May and June prove exceptionally hot; mean monthly temperatures in the region hover around 35 °C (95 °F), with daily maxima occasionally topping 50 °C (122 °F). During winters, temperatures in some areas can drop below freezing due to waves of cold air from Central Asia. A large diurnal range of about 14 °C (57 °F) appears during summer; that widens by several degrees during winter. East of the Thar Desert, the region running from Punjab and Haryana to Kathiawar experiences a tropical and sub-tropical steppe climate. The zone, a transitional climatic region separating tropical desert from humid sub-tropical savanna and forests, experiences temperatures less extreme than those of the desert. Average annual rainfall measures 30–65 centimetres (12-26 in), although very unreliable; as in much of the rest of India, the southwest monsoon accounts for most precipitation. Daily summer temperature maxima rise to around 40 °C (104 °F). The resulting natural vegetation typically comprises short, coarse grasses. Most of Northeast India and much of North India experience a humid sub-tropical climate. Though they experience hot summers, temperatures during the coldest months may fall as low as 0 °C (32 °F). 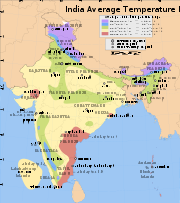 Due to ample monsoon rains, India has only one subtype of that climate, Cfa (under the Köppen system). In most of that region, little measureable precipitation falls during the winter, owing to powerful anticyclonic and katabatic (downward-flowing) winds from Central Asia. Due to the region's proximity to the Himalayas, it experiences elevated prevailing wind speeds, again from the influence of Central Asian katabatic movements. Humid subtropical regions experience pronounced dry winters. Winter rainfall, and occasionally snowfall, associates with large storm systems such as "Nor'westers" and "Western disturbances"; westerlies steer the latter towards the Himalayas. Most summer rainfall occurs during powerful thunderstorms associated with the southwest summer monsoon; occasional tropical cyclones also contribute. Annual rainfall ranges from less than 1,000 millimeters (39 in) in the west to over 2,500 millimeters (98 in) in parts of the northeast. As most of that region lay far from the ocean, the wide temperature swings more characteristic of a continental climate predominate, with wider swings than in those in tropical wet regions, ranging from 24 °C (75 °F) in north-central India to 27 °C (81 °F) in the east. Pangong Lake in Ladakh, an arid montane region lying deep within the Himalayas. India's northernmost fringes experience a montane, or alpine, climate. In the Himalayas, the rate at which an air mass's temperature falls per kilometre (3,281 ft) of altitude gained (the adiabatic lapse rate) is 5.1 °C/km. In terms of environmental lapse rate, ambient temperatures fall by 0.6 °C (1.1 °F) for every 100 meters (328 ft) rise in altitude. Thus, climates ranging from nearly tropical in the foothills to tundra above the snow line can coexist within several dozen miles of each other. Sharp temperature contrasts between sunny and shady slopes, high diurnal temperature variability, temperature inversions, and altitude-dependent variability in rainfall commonly occur. The northern side of the western Himalayas, also known as the trans-Himalayan belt, constitutes a region of barren, arid, frigid, and wind-blown wastelands. Most precipitation occurs as snowfall during the late winter and spring months. Areas south of the Himalayas enjoy protection much of the time from cold winter winds coming in from the Asian interior. The leeward side (northern face) of the mountains receives less rain while the southern slopes, well-exposed to the monsoon, get heavy rainfall. Areas situated at elevations of 1,070-2,290 metres (3,510-7,510 ft) receive the heaviest rainfall, which decreases rapidly at elevations above 2,290 meters (7,513 ft). The Himalayas experience their heaviest snowfall between December and February and at elevations above 1,500 meters (4,921 ft). Snowfall increases with elevation by up to several dozen millimetres per 100 metre (~2 in/330 ft) increase. Elevations above 5,000 meters (16,404 ft) never experience rain; all precipitation falls as snow. A winter scene in Bandhavgarh National Park, Madhya Pradesh. Winter, occurring between January and March. The year's coldest months are December and January, when temperatures average around 10–15 °C (50–59 °F) in the northwest; temperatures rise as one proceeds towards the equator, peaking around 20–25 °C (68–77 °F) in mainland India's southeast. Summer or pre-monsoon season, lasting from March to June (April to July in northwestern India). In western and southern regions, the hottest month is April; for northern regions, May is the hottest month. Temperatures average around 32–40 °C (90–104 °F) in most of the interior. Monsoon or rainy season, lasting from June to September. The season is dominated by the humid southwest summer monsoon, which slowly sweeps across the country beginning in late May or early June. Monsoon rains begin to recede from North India at the beginning of October. Post-monsoon season, lasting from October to December. South India typically receives more precipitation. Monsoon rains begin to recede from North India at the beginning of October. In northwestern India, October and November are usually cloudless. Parts of the country experience the dry northeast monsoon. The Himalayan states, being more temperate, experience an additional two seasons: autumn and spring. Traditionally, Indians note six seasons, each about two months long. These are the spring (Sanskrit: vasanta), summer (gri?ma), monsoon season (var?a), early autumn (sarada), late autumn (hemanta), and winter (sisira). These are based on the astronomical division of the 12 months into six parts. The ancient Hindu calendar also reflects these seasons in its arrangement of months. Once the monsoons subside, average temperatures gradually fall across India. As the Sun's vertical rays move south of the equator, most of the country experiences moderately cool weather; temperatures change by about 0.6 °C (1.35 °F) per degree of latitude. December and January constitute the coldest months, with mean temperatures of 10–15 °C (50–59 °F) in Indian Himalayas. The east and south experience higher mean temperatures, where they reach 20–25 °C (68–77 °F). In northwestern India, virtually cloudless conditions prevail in October and November, resulting in wide diurnal temperature swings; as in much of the Deccan Plateau, they range between 16–20 °C (61–68 °F). From March to May, "western disturbances" bring heavy bursts of rain and snow. Those extra-tropical low-pressure systems originate in the eastern Mediterranean Sea, carried towards India by the subtropical westerlies, the prevailing winds blowing at North India's range of latitude. Once the Himalayas hinder their passage, they stop, releasing heavy precipitation over the southern Himalayas. The three Himalayan states (Jammu and Kashmir in the extreme north, Himachal Pradesh, and Uttarakhand) experience heavy snowfall; in Jammu and Kashmir, blizzards occur regularly, disrupting travel and other activities. Even in winter, temperatures in the Andaman and Nicobar Islands (pictured) and Lakshadweep remain remarkably equable; monthly averages do not vary by more than 2 °C (3.6 °F). The rest of North India, including the Indo-Gangetic Plain, almost never receives snow. In the plains, temperatures occasionally fall below freezing, though never for more one or two days. Winter highs in Delhi range from 16 °C (61 °F) to 21 °C (70 °F). Nighttime temperatures average 2–8 °C (36–46 °F). In the Punjab plains, lows can fall below freezing, dropping to around −6 °C (21 °F) in Amritsar. Frost sometimes occurs, but the notorious fog marks the season, frequently disrupting daily life; fog grows thick enough to hinder visibility and disrupt air travel 15–20 days annually. Eastern India enjoys a much milder climate, experiencing moderately warm days and cool nights. Highs range from 23 °C (73 °F) in Patna to 26 °C (79 °F) in Kolkata (Calcutta); lows average from 8 °C (46 °F) in Patna to 14 °C (57 °F) in Kolkata. Frigid winds from the Himalayas on occasion depress temperatures near the Brahmaputra River. The two Himalayan states in the east, Sikkim and Arunachal Pradesh, receive substantial snowfall. The extreme north of West Bengal, centered around Darjeeling, also experiences snowfall, but only rarely. In South India, particularly the hinterland of Maharashtra, Madhya Pradesh, parts of Karnataka, and Andhra Pradesh, somewhat cooler weather prevails. Minimum temperatures in western Maharashtra, Madhya Pradesh and Chhattisgarh hover around 10 °C (50 °F); in the southern Deccan Plateau, they reach 16 °C (61 °F). Coastal areas, especially those near the Coromandel Coast, and low-elevation interior tracts experience warm temperatures, with daily highs of 30 °C (86 °F) and lows of around 21 °C (70 °F). The Western Ghats, including the Nilgiri Range, experience exceptional temperatures with lows sometimes fall below freezing. That compares with a range of 12–14 °C (54–57 °F) on the Malabar Coast where, as with other coastal areas, the Indian Ocean exerts a strong moderating influence on weather. A summer view of Khajjiar, a hill station in Himachal Pradesh. Summer in northwestern India lasts from April to July, and in the rest of the country from March to June. The temperatures in the north rise as the vertical rays of the Sun reach the Tropic of Cancer. April has the hottest temperatures for the western and southern regions of the country, while May has the hottest temperatures for most of North India. Temperatures of 50 °C (122 °F) and higher have been recorded in parts of India during that season. In cooler regions of North India, immense pre-monsoon squall-line thunderstorms, known locally as "Nor'westers," commonly drop large hailstones. Near the coast the temperature hovers around 36 °C (97 °F), and the proximity of the sea increases the level of humidity. In southern India, the east coast experiences higher temperatures than the west coast by a few degrees. By May, most of the Indian interior experiences mean temperatures over 32 °C (90 °F), while maximum temperatures often exceed 40 °C (104 °F). In the hot months of April and May, western disturbances, with their cooling influence, may still arrive, but rapidly diminish in frequency as summer progresses. Notably, a higher frequency of such disturbances in April correlates with a delayed monsoon onset (thus extending summer) in northwest India. In eastern India, monsoon onset dates have been steadily advancing over the past several decades, resulting in shorter summers there. Altitude affects the temperature to a large extent, with higher parts of the Deccan Plateau and other areas being relatively cooler. Hill stations, such as Ootacamund ("Ooty") in the Western Ghats and Kalimpong in the eastern Himalayas, with average maximum temperatures of around 25 °C (77 °F), offer some respite from the heat. At lower elevations, in parts of northern and western India, a strong, hot, and dry wind known as the Loo blows in from the west during the daytime; with very high temperatures, in some cases up to around 45 °C (113 °F); it can cause fatal cases of sunstroke. Tornadoes occur rarely, concentrated in a corridor stretching from northeastern India towards Pakistan; only several dozen have been reported since 1835. Onset dates and prevailing wind currents of the southwest summer and northeast winter monsoons. Regional variation in rainfall across India. The monsoon season delivers four-fifths of the country's precipitation. The southwest summer monsoon, a four-month period when massive convective thunderstorms dominate India's weather, constitutes the Earth's most valuable wet season. Resulting from the southeast trade winds originating from a high-pressure mass centered over the southern Indian Ocean, a low-pressure region centered over South Asia attracts monsoons. They give rise to surface winds that ferry humid air into India from the southwest. Those inflows ultimately result from a northward shift of the local jet stream, which itself results from rising summer temperatures over Tibet and the Indian subcontinent. The void left by the jet stream, which switches from a route just south of the Himalayas to one tracking north of Tibet, then attracts warm, humid air. The high summer temperature difference between Central Asia and the Indian Ocean embodies the main factor behind that shift. Accompanied by a seasonal excursion of the normally equatorial intertropical convergence zone (ITCZ), a low-pressure belt of highly unstable weather moves northward towards India. That system intensified to its present strength as a result of the Tibetan Plateau's uplift, accompanying the Eocene–Oligocene transition event, a major episode of global cooling and aridification occurring 34–49 mya. The southwest monsoon arrives in two branches: the Bay of Bengal branch and the Arabian Sea branch. The latter extends toward a low-pressure area over the Thar Desert, measuring roughly three times stronger than the Bay of Bengal branch. The monsoon usually breaks over Indian territory by around May 25, when it lashes the Andaman and Nicobar Islands in the Bay of Bengal. It strikes the Indian mainland around June 1, supplies over 80 percent of India's annual rainfall. first appearing near the Malabar Coast of Kerala. By June 9, it reaches Mumbai; it appears over Delhi by June 29. The Bay of Bengal branch, which hugs the Coromandal Coast between Cape Comorin and Orissa, swerves to the northwest. The Arabian Sea branch moves northeast towards the Himalayas. By the first week of July, the entire country experiences monsoon rain; on average, South India receives more rainfall than North India. Yet Northeast India receives the most precipitation. Monsoon clouds begin retreating from North India by the end of August; it withdraws from Mumbai by October 5. As India further cools during September, the southwest monsoon weakens. By the end of November, it has left the country. Pre-monsoon clouds, as they appear in Mumbai, western Maharashtra. Monsoon rains impact the health of the Indian economy; as Indian agriculture employs 600 million people and comprises 20 percent of the national GDP, good monsoons correlate with a booming economy. Weak or failed monsoons (droughts) result in widespread agricultural losses and substantially hinder overall economic growth. The rains reduce temperatures and replenish groundwater tables, rivers, and lakes. 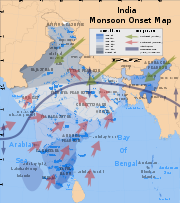 During the post-monsoon months of October to December, a different monsoon cycle, the northeast (or "retreating") monsoon, brings dry, cool, and dense Central Asian air masses to large parts of India. Winds spill across the Himalayas and flow to the southwest across the country, resulting in clear, sunny skies. Though the India Meteorological Department (IMD) and other sources refers to that period as a fourth ("post-monsoon") season, other sources designate only three seasons. Depending on location, that period lasts from October to November, after the southwest monsoon has peaked. Less and less precipitation falls, and vegetation begins to dry out. In most parts of India, that period marks the transition from wet to dry seasonal conditions. Average daily maximum temperatures range between 28 °C and 34 °C (82–93 °F). The northeast monsoon, which begins in September, lasts through the post-monsoon seasons, and only ends in March, carries winds that have already lost their moisture while crossing central Asia and the vast rain shadow region lying north of the Himalayas. They cross India diagonally from northeast to southwest. The large indentation made by the Bay of Bengal into India's eastern coast means that the flows humidify before reaching Cape Comorin and rest of Tamil Nadu, meaning that the state, and also some parts of Kerala, experience significant precipitation in the post-monsoon and winter periods. Parts of West Bengal, Orissa, Andhra Pradesh, Karnataka and North-East India also receive minor precipitation from the northeast monsoon. Temperature and precipitation data for selected Indian cities, representing the full variety of major Indian climate types, follow. Figures have been grouped by the four-season classification scheme used by the IMD,[a] along with year-round averages and totals. Monthly temperature and rainfall averages in Chennai. Monthly temperature and rainfall averages in Mumbai. Map showing winds zones, shaded by distribution of average speeds of prevailing winds. 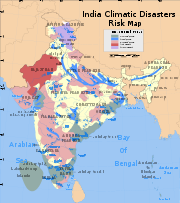 Climate-related natural disasters cause massive losses of Indian life and property. Droughts, flash floods, cyclones, avalanches, landslides brought on by torrential rains, and snowstorms pose the greatest threats. Other dangers include frequent summer dust storms, which usually track from north to south; they cause extensive property damage in North India and deposit large amounts of dust from arid regions. Hail commonly falls in parts of India, causing severe damage to standing crops such as rice and wheat. In the Lower Himalaya, landslides occur frequently. The young age of the region's hills result in labile rock formations, prone to slippages. Rising population and development pressures, particularly from logging and tourism, cause deforestation. The result, denuded hillsides, exacerbates the severity of landslides, since tree cover impedes the downhill flow of water. Parts of the Western Ghats also suffer from low-intensity landslides. Avalanches occur in Kashmir, Himachal Pradesh, and Sikkim. Floods constitute the most common natural disaster in India. The heavy southwest monsoon rains cause the Brahmaputra and other rivers to distend their banks, often flooding surrounding areas. Though they provide rice paddy farmers with a largely dependable source of natural irrigation and fertilization, the floods can kill thousands and displace millions. Excess, erratic, or untimely monsoon rainfall may also wash away or otherwise ruin crops.</ref> Almost all of India has high flood risk, and extreme precipitation events, such as flash floods and torrential rains, have become increasingly common in central India over the past several decades, coinciding with rising temperatures. Mean annual precipitation totals have remained steady due to the declining frequency of weather systems that generate moderate amounts of rain. Satellite imagery of Cyclone 05B in the Bay of Bengal. Tropical cyclones, severe storms spun off from the Intertropical Convergence Zone, may affect thousands of Indians living in coastal regions. Tropical cyclogenesis ocurrs frequently in the northern reaches of the Indian Ocean in and around the Bay of Bengal. Cyclones bring with them heavy rains, storm surges, and winds that often cut affected areas off from relief and supplies. In the North Indian Ocean Basin, the cyclone season runs from April to December, with peak activity between May and November. Each year, an average of eight storms with sustained wind speeds greater than 63 km/h (39 mph) form; of those, two strengthen into true tropical cyclones, with sustained gusts greater than 117 km/h (73 mph). On average, a major (Category 3 or higher) cyclone develops every other year. During summer, the Bay of Bengal experiences intense heating, giving rise to humid and unstable air masses that produce cyclones. Many powerful cyclones, including the 1737 Calcutta cyclone, the 1970 Bhola cyclone, and the 1991 Bangladesh cyclone, have led to widespread devastation along parts of the eastern coast of India and neighboring Bangladesh. Widespread death and property destruction result every year in exposed coastal states such as Andhra Pradesh, Orissa, Tamil Nadu, and West Bengal. India's western coast, bordering the more placid Arabian Sea, experiences cyclones only rarely; those mainly strike Gujarat and, less frequently, Kerala. In terms of damage and loss of life, Cyclone 05B, a supercyclone that struck Orissa on October 29, 1999, stands as the worst in more than a quarter-century. With peak winds of Template:Convert/mi:h, the cyclone had the equivalent of a Category 5 hurricane. Almost two million people lost their homes; while the storm disrupted the lives of another 20 million people lives. Officially, 9,803 people died from the storm; unofficial estimates place the death toll at over 10,000. The dry bed of the Niranjana River, Bihar. Indian agriculture depends heavily on the monsoon as a source of water. In some parts of India, the failure of the monsoons result in water shortages, resulting in below-average crop yields, especially in major drought-prone regions such as southern and eastern Maharashtra, northern Karnataka, Andhra Pradesh, Orissa, Gujarat, and Rajasthan. In the past, droughts have periodically led to major Indian famines. Those include the Bengal famine of 1770, with up to one third of the population in affected areas dead; the 1876–1877 famine, with over five million people dead; the 1899 famine, when over 4.5 million died; and the Bengal famine of 1943, with over five million dead from starvation and famine-related illnesses. All such episodes of severe drought correlate with El Niño-Southern Oscillation (ENSO) events. El Niño-related droughts have also been implicated in periodic declines in Indian agricultural output. Nevertheless, ENSO events that have coincided with abnormally high sea surfaces temperatures in the Indian Ocean—in one instance during 1997 and 1998 by up to 3 °C (5 °F)—have resulted in increased oceanic evaporation, resulting in unusually wet weather across India. Such anomalies have occurred during a sustained warm spell that began in the 1990s. Contrastingly, instead of the usual high pressure air mass over the southern Indian Ocean, an ENSO-related oceanic low pressure convergence center forms; it then continually pulls dry air from Central Asia, desiccating India during what should have been the humid summer monsoon season. That reversed air flow causes India's droughts. The extent that an ENSO event raises sea surface temperatures in the central Pacific Ocean influences the degree of drought. Alwar, on the fringes of the Thar Desert, registered a temperature of 50.6 °C (123 °F), India's highest. India's lowest recorded temperature, recorded unoffically, read −45 °C (−49 °F) in Dras, Ladakh, in eastern Jammu and Kashmir. Further south, readings as low as −30.6 °C (−23 °F) have been taken in Leh, also in Ladakh. Temperatures on the Indian-controlled Siachen Glacier near Bilafond La 5,450 meters (17,881 ft) and Sia La 5,589 meters (18,337 ft) have fallen below −55 °C (−67 °F), while blizzards bring wind speeds in excess of 250 km/h (155 mph), or hurricane-force winds ranking at 12 (the maximum) on the Beaufort scale. Those conditions, not actual military engagements, resulted in more than 97 percent of the roughly 15,000 casualties suffered by India and Pakistan over the course of conflict in the region. The highest official temperature reading of 50.6 °C (123 °F) came from Alwar, Rajasthan in 1955. Pachpadra in Rajasthan also reported that mark. Recently, claims have been made of temperatures touching 55 °C (131 °F) in Orissa; those have been met with some skepticism by the India Meteorological Department (IMD), which has questioned the methods used in recording such data. The average annual precipitation of 11,871 millimeters (467 in) in the village of Mawsynram, in the hilly northeastern state of Meghalaya, represents the highest recorded in Asia, and possibly on Earth. The village, which sits at an elevation of 1,401 meters (4,596 ft), benefits from its proximity to both the Himalayas and the Indian Ocean. The town of Cherrapunji, 5 kilometers (3 mi) to the east, constituting the nearest town to host a meteorological office (none has ever existed in Mawsynram), has been officially credited as being the world's wettest place. In recent years, the Cherrapunji-Mawsynram region has averaged 9,296 millimeters (366 in) of rain annually, though Cherrapunji has had at least one period of daily rainfall that lasted almost two years. 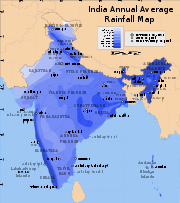 India's highest recorded one-day rainfall total occurred on July 26, 2005, when Mumbai received more than 650 millimeters (26 in); the massive flooding that resulted killed over 900 people. In terms of snowfall, regions of Jammur and Kashmir, such as Baramulla district in the east and the Pir Panjal Range in the southeast, experience exceptionally heavy snowfall. Kashmir's highest recorded monthly snowfall occurred in February of 1967, when 8.4 meters (331 in) fell in Gulmarg, though the IMD has recorded snowdrifts up to 12 meters (39 ft) in several Kashmiri districts. In February of 2005, more than 200 people died when, in four days, a western disturbance brought up to 2 meters (7 ft) of snowfall to parts of the state. Lakshadweep, comprising tiny low-lying islands, stand at risk inundation by sea level rises associated with global warming. Several effects of global warming, including steady sea level rise, increased cyclonic activity, and changes in ambient temperature and precipitation patterns, have impacted India. Ongoing sea level rises have submerged several low-lying islands in the Sundarbans, displacing thousands of people. Temperature rises on the Tibetan Plateau, causing Himalayan glaciers to retreat, may reduce the flow rate of the Ganges, Brahmaputra, Yamuna, and other major rivers; hundreds of thousands of farmers depend on those rivers. According to a 2007 World Wide Fund for Nature (WWF) report, the Indus River may run dry for the same reason. Increased landslides and flooding are projected to impact such states as Assam. Ecological disasters, such as a 1998 coral bleaching event that killed off more than 70 percent of corals in the reef ecosystems off Lakshadweep and the Andamans, had been triggered by elevated ocean temperatures tied to global warming; scientists project more frequent occurences. The Indira Gandhi Institute of Development Research has reported that, if the predictions relating to global warming made by the Intergovernmental Panel on Climate Change come to fruition, climate-related factors could cause India's GDP to decline by up to 9 percent. Contributing to that would be shifting growing seasons for major crops such as rice, production of which could fall by 40 percent. Scientists project the displacement of around seven million people due to, among other factors, submersion of parts of Mumbai and Chennai, if global temperatures rise by a mere 2 °C (36 °F). Such shifts have happened before. Earlier in the Holocene epoch (4,800–6,300 years ago), parts of the Thar Desert supported perennial lakes; researchers have proposed that resulted from much higher winter precipitation, which coincided with stronger monsoons. Similarly, Kashmir, which once had a warm subtropical climate, shifted to a substantially colder temperate climate 2.6–3.7 mya. As a result, Kashmir has been repeatedly subjected to extended cold spells starting 600,000 years ago. Clouds of thick haze and smoke form along the Ganges River Basin. Thick haze and smoke, originating from burning biomass in northwestern India and air pollution from large industrial cities in northern India, often concentrate inside the Ganges Basin. Prevailing westerlies carry aerosols along the southern margins of the steep-faced Tibetan Plateau to eastern India and the Bay of Bengal. Dust and black carbon, which are blown towards higher altitudes by winds at the southern margins of the Himalayas, can absorb shortwave radiation and heat the air over the Tibetan Plateau. The net atmospheric heating due to aerosol absorption causes the air to warm and convect upwards, increasing the concentration of moisture in the mid-troposphere and providing positive feedback that stimulates further heating of aerosols. ↑ 7.0 7.1 C. A. Posey. The Living Earth Book of Wind and Weather. (Reader's Digest Association, 1994), 118. ↑ J. Heitzman and R. L. Worden. India: A Country Study. (Washington, DC: Library of Congress (Area Handbook Series), 1996), 97. ↑ T. S. Chouhan. Desertification in the World and Its Control. (Scientific Publishers, 1992), 7. ↑ C. Caviedes. Niño in History: Storming Through the Ages. (University Press of Florida, 2001. ISBN 0813020999), 124. ↑ C. Carpenter, 2005 "The environmental control of plant species density on a Himalayan elevation gradient." Journal of Biogeography 32 (6):999–1018. ↑ P. Singh, N. Kumar, 1997 "Effect of orography on precipitation in the western Himalayan region." Journal of Hydrology 199 (1): 183–206. ↑ P. R. Pisharoty, B. N. Desai, "Western disturbances and Indian weather." Indian Journal of Meteorological Geophysics 7 (1956): 333–338. ↑ R. E. Peterson, K. C. Mehta, "Climatology of tornadoes of India and Bangladesh." Meteorology and Atmospheric Physics 29 (4) ( December 1981): 345–356. ↑ W. Collier and R. Webb. Floods, Droughts and Climate Change. (University of Arizona Press, 2002. ISBN 0816522502), 91. ↑ 22.0 22.1 22.2 W. J. Burroughs. The Climate Revealed. (Cambridge University Press, 1999. ISBN 0521770815), 138–139. ↑ G. O'Hare, "The Indian Monsoon, Part Two: The Rains." Geography 82 (4) (1997):335. ↑ E. Balfour. Encyclopaedia Asiatica: Comprising Indian Subcontinent, Eastern and Southern Asia. (Cosmo Publications, 1976. ISBN 8170203252), 995. ↑ M. Allaby. Floods. (Facts on File, 1998. ISBN 0816035202), 26. ↑ J. M. Nash. El Niño: Unlocking the Secrets of the Master Weather Maker. (Warner, 2002. ISBN 0446524816), 22–23. ↑ Collier and Webb, 67. ↑ "World's Top Ten Rivers at Risk" wwfindia. Retrieved September 17, 2009. ↑ Badarinath KVS, Chand TRK, Prasad VK (2006). Agriculture crop residue burning in the Indo-Gangetic Plains—A study using IRS-P6 AWiFS satellite data. Current Science 91 (8): 1085–1089. Allaby, M. Floods. Facts on File, 1998. ISBN 0816035202. Allaby, M. Encyclopedia of Weather and Climate. 2002. Facts on File. ISBN 0816040710. Balfour, E. Encyclopaedia Asiatica: Comprising Indian Subcontinent, Eastern and Southern Asia. Cosmo Publications, 1976. ISBN 8170203252. Burroughs, W. J. The Climate Revealed. Cambridge University Press, 1999. ISBN 0521770815. Caviedes, C. Niño in History: Storming Through the Ages. University Press of Florida, 2001. ISBN 0813020999. Chouhan, T. S. Desertification in the World and Its Control. Scientific Publishers, 1992. ISBN 817233043X. Collier, W., and R. Webb. 'Floods, Droughts and Climate Change. University of Arizona Press, 2002. ISBN 0816522502. Heitzman, J., and R. L. Worden. India: A Country Study. Library of Congress (Area Handbook Series), 1996. ISBN 0844408336. Nash, J. M. El Niño: Unlocking the Secrets of the Master Weather Maker. Warner, 2002. ISBN 0446524816. Posey, C. A. The Living Earth Book of Wind and Weather. Reader's Digest Association, 1994. ISBN 0895776251. Singh, V.P., C.S.P. Ojha, and N. Sharma. The Brahmaputra Basin Water Resources. Springer, 2004. ISBN 1402017375. Toman, M.A., U. Chakravorty, and S. Gupta. India and Global Climate Change: Perspectives on Economics and Policy from a Developing Country. Resources for the Future Press, 2003. ISBN 1891853619. History of "Climate of India"
This page was last modified on 3 March 2017, at 17:52.